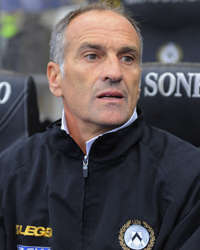 Sunday's posticipo suggested that it wouldn't be outrageous if Milan were to include Francesco Guidolin's name in the list of people to thank for their increasingly imminent Scudetto. Sure, their own work in the 3-0 thrashing of Sampdoria heaped pressure on their closest rivals to maintain a viable distance, but it was Guidolin who helped the Rossoneri to disappear around the bend--six points ahead of Napoli and eight ahead of Inter, who lost 2-0 to Parma. Unexpectedly, Udinese diligently unraveled Napoli's season with a 2-1 win at the San Paolo. Unexpectedly, not because they haven't shown that they have the quality to do so, but because they were missing their two forwards who have ripped through any defence this season: Antonio Di Natale and Alexis Sanchez. Guidolin's work, functioning more subtly week in and week out, was suddenly laid bare. How would the coach cope with two star absences? How would he cope with the pressure of being so close to the Champions League spots? Guidolin coped with both admirably and without fuss. In the absence of his star duo, the coach deployed the more pedestrian German Denis--a Napoli outcast--supported by Asamoah in a 4-4-1-1 formation. The midfield of Isla, Gokhan Inler, Pablo Armero and Giampaolo Pinzi provided the required containment. Inler's scorching goal from distance and Denis's less spectacular one minutes later was enough to knock Napoli off balance. Even Edinson Cavani, who has scored so many late winners for Napoli this season, failed to convert a penalty, seeing his timid shot saved by the inspired Samir Handanovic. Unruffled, Guidolin made a winning accommodation to bring home three very valuable points in Udinese's quest for the Champions League. It seems the only thing more understated than Guidolin's demeanour is his reputation. Within Italy he has never coached any of the upper-class clubs, and apart from spare newspaper conjectures, his name almost never appears in a short-long list of bona fide contenders to take over the likes of Inter or Juventus. Not that he is one to complain. The 55-year-old has done it quietly, almost always. At Vicenza, during the late 1990s, Guidolin earned his right to prominence not by winning a widely coveted trophy, but rather by winning promotion to Serie A and a European Cup-Winner's Cup quarter-final against Dutch side Roda. Even the resounding 9-1 aggregate win over Roda, however, facilitated a move to Udinese, who had then and still have a reputation of producing and fostering precocious talent for a profit. The move was considered a step in the right direction, but concluded in mid-table obscurity. Since then, Guidolin has coached Bologna, Monaco, and Palermo amongst others, but with marginal distinction. Yet, the feeling persists that perhaps with the exception of Monaco, the coach was working well with what he had. At Palermo, to use the most poignant example, his lot was a theatrically irascible owner by the name of Maurizio Zamparini, who farcically sacked and reinstated Guidolin four times. Even though he coped with Zamparini's dismaying behaviour with notable grace, there was something palpably pitiable about about the way Guidolin kept coming back. His forced retreats and voluntary returns were his biggest defeats, symptomatic of a man desperate to do what he loves and for any gargoyle. What Guidolin needed was a club that would provide him what every Italian football person--be it player, administrator, or coach--yearns for in a profession notorious for regular upheaval: serenità e tranquilità. The bar had been set exremely low, admittedly. After working for Zamparini, coaches must feel they are immune from natural disasters, much less the whims of owners, so even a modicum of serenità e tranquilità would be welcomed by Guidolin. At Udinese, at the second time of asking, Guidolin has finally found that and a host of other things, including outstanding players and Giampaolo Pozzo, an owner ho does not have his fingers hovering around Guidolin's work. It is unsurprising, then, that finally the coach has forged a team with the capability to materialize his vision so convincingly. Lying just a point behind Lazio, who occupy the final Champions League spot, Udinese have every chance of lining up to the Champions League anthem next season, a reality that has allowed a glimpse of rare smugness, even swagger in Guidolin. "We're back in the race for the Champions League after today's result," said Guidolin matter-of-factly in the post-match conferece on Sunday, before adding, "people will be talking about Udinese when discussing Champions League qualification at least until Easter." Finally, at long last, Guidolin is making some real noise. Welcome to not even an oriundo!